When it comes to kitchen remodeling and upgrading the cooking area, one of the best improvements come from the opens for kitchen islands. The kitchen is an area where your family and friends congregate during the holidays or for family meals on the regular. Adding a nice new island not only expands the functional area in your kitchen but is also where your guests can hang out or even help while you cook. 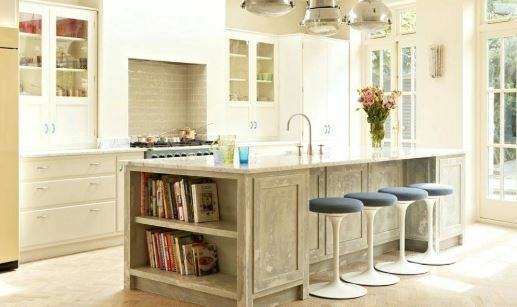 Below we will list some of the kitchen island ideas we can help install in your new kitchen design. A waterfall edge kitchen island is by far the most popular design choice with a benchtop surface cascading down to the floor. The relative affordability and practicality make this a top design choice for new remodels. This area can easily be utilized for more than just cooking and storage. This style of the island gives the impression of one large island centerpiece crafted from a single block or stone with a minimalist finish. The simple overhang of the classic breakfast bar idea has become more practical in the modern kitchen to be utilized for more than just eating. The innovations this style of an island can provide any new kitchen idea can easily complement and accommodate various functions and styles. One way to maximize space and also combine the kitchen and dining area with a full-length eating area is an innovation that solves two problems with one solution. Due to the complexity of this style of design, it is often reserved for more complicated remodel ideas as it brings a more impressive and unique look. These are just a few of the kitchen island design options available that Becckworth LLC would be happy to discuss with you. We will make sure to educate you as well as recommend the best options and materials for your home. Just Give us a call or requests a free quote here.